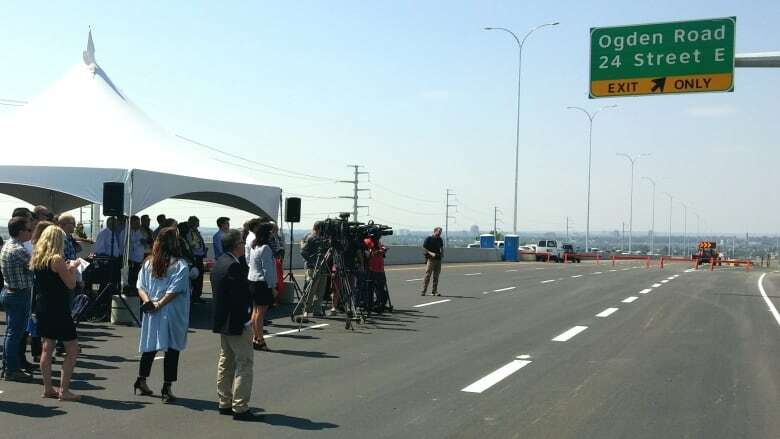 A major interchange at Ogden Road and Glenmore Trail in Calgary's southeast is now open, after two years of construction, although work continues on the roadway. The $90-million interchange and road project means there are no longer any traffic lights on Glenmore between Sarcee Trail and Barlow Trail. It also eliminates a train crossing by elevating traffic over the tracks. This will allow the Green Line to flow underneath the major roadway, which handles more than 40,000 vehicles per day, according to the city. "The new, six-lane Glenmore Trail and interchange at Ogden Road will help make sure goods move efficiently through our city and province to distribution centres and industrial areas," said transportation general manager Mac Logan in a news release. Coun. Gian-Carlo Carra, who represents the area, said the project should also help alleviate traffic cutting through residential areas in Ogden along 18th Street. "This project was not just about good movement, it was about improving neighbourhood life," he said at the opening of the interchange. The area is a transition zone from residential areas in the west to the industrial zones on Calgary's eastern edge. Included in the project is improved sidewalks and pathways, with a continuous pathway between 18th Street and 52nd Street S.E. that connects to the canal pathway system. The interchange is one of four interchange projects expected to be completed this summer within Calgary, part of a $250-million investment in transportation infrastructure. A fifth interchange, at Sarcee Trail at the Trans-Canada Highway, is expected to be completed by October.